If you click the Account Actions button in Quicken 2012, you notice that it displays a bunch of commands. If you choose the Sorting Options command, Quicken displays a submenu of commands that begin with By. These commands all work the same basic way. They let you reorganize the transactions shown in the register in some new way: by date, amount, check number, and so on. Normally, Quicken displays a single row of information about each check that you enter. It also displays a single row of information about each of the other types of transactions you enter. The single-row approach is often pretty illegible, unfortunately. If you want to show more transaction information, click the Account Actions button (which appears near the top-right corner of the register), and then choose the Two-Line Display command on the menu that Quicken displays. 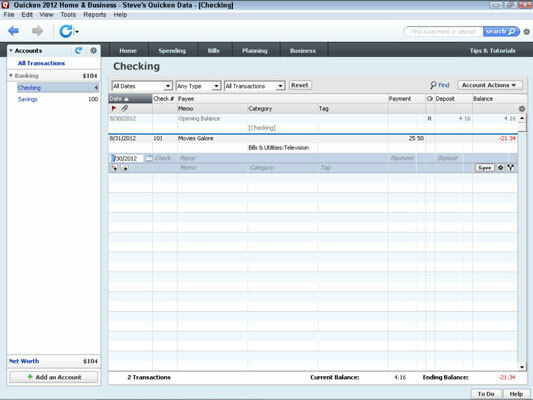 After you do, Quicken displays all the register information in a double-line format. To return to the single-line format, click the Account Actions button and choose the Two-Line Display again. If you point to the column heading for the Payee field, the Payment field, or the Cleared Status field (labeled with Clr), Quicken displays a pop-up command that you can use to re-sort the transactions in the register. These options are self-explanatory. The one that appears when you point to the Payee field is Sort By Payee. And the one that appears when you point to the Cleared Status field is Sort By Cleared. You get the picture.